New! WW2 saw Swansea Town extensively bombed by the German Luftwaffe. At this time the Swansea Borough Police were also the Fire Service. The Borough Police requested the assistance of the adjoining Glamorganshire Constabulary. This request resulted in the secondment of Police Officers from 'H' Division of the Glamorgan Constabulary being deployed with Borough Officers in and around the Town of Swansea. This video is an account of a Glamorgan Constabulary Police Officer involved in policing duties during the 3 nights blitz of Swansea. Did you know that South Wales Police have a huge presence on Youtube? You can view some of the collection of videos right here. Use the search words 'youtube south wales police' using Google to find many more! Courtesy of Peter Hall - "Here is a link to a programme I was involved in filming for ITV Wales on the unsolved murder of Muriel Drinkwater at Penllagaer Woods in the 1940s. Retired Det Supt Roy Davies and Retired Det Ch/Supt Wynne Phillips are featured". A video interview with retired PC Hubert Thomas talking about policing in the Swansea Borough Police and South Wales Constabulary between the years 1951 to 1982. Police Officers on duty in Swansea. Here is another further contribution sent to us by Peter Hall - January 2019. 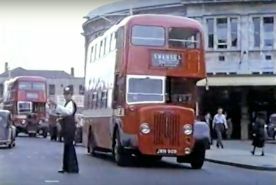 The officer on point duty (about 1960's) (last pic) is a screen grab from a video outside High Street Station. A short 'silent movie' clip of this video can be viewed here.